Those of you who had read my Camden Blog will know how fascinated I am with the eclectic culture of Camden with its array of street food cuisines, incense-infused stalls and treasure trove of trinkets and vintage finds, therefore when the opportunity arose to dine at Gilgamesh in Camden to celebrate my friend Amy’s 30th birthday I was probably more excited than the birthday girl. 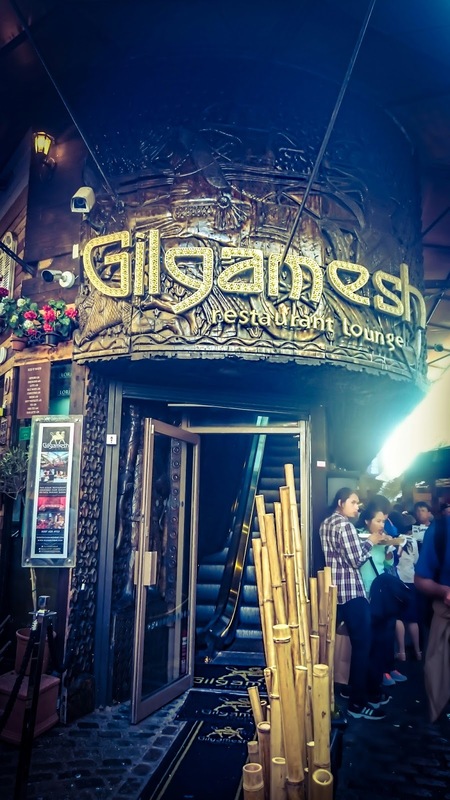 Amidst the labyrinth of street food eateries, located in the heart of The Stables Market in Camden is the Pan-Asian restaurant Gilgamesh. 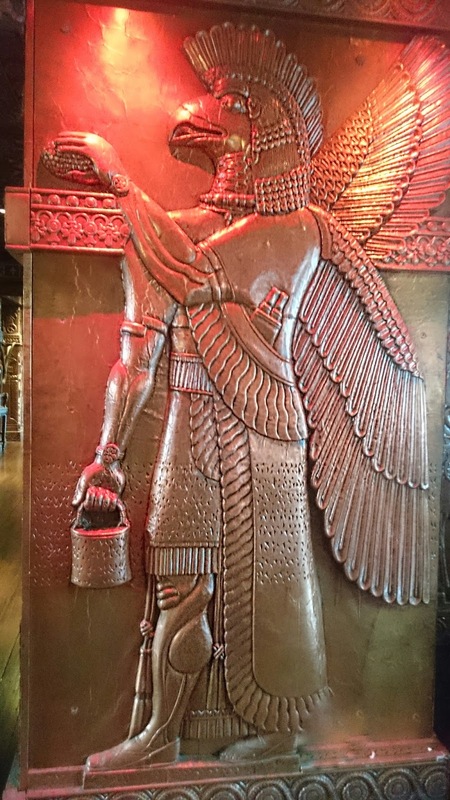 Accessed via a red carpet entrance, adorned with bamboo, you are transported by-way of an intriguing one-way escalator into a mesmerising Babylonian shrine with floor-to-ceiling wood-carved sculptures and windows. 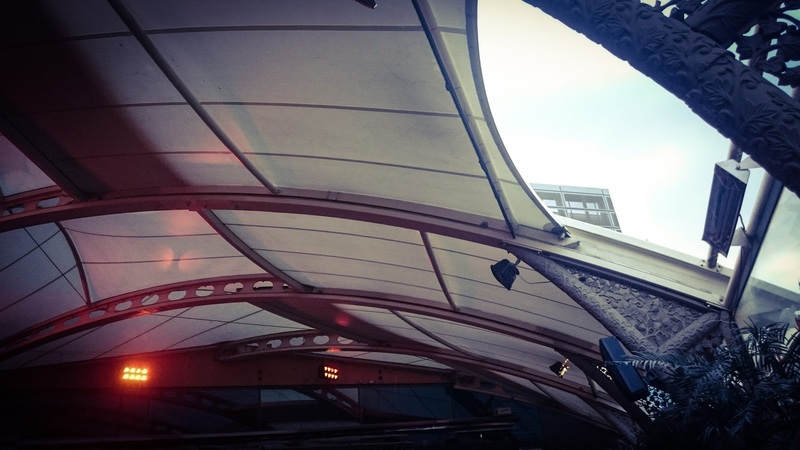 We were warmly welcomed and taken to the floor lit bar area, lined with vases containing fuchsia pink flowers with leather-bound booth seating areas overlooking the twinkly fairy lights of the Stables Market, which was hosting the open-air Backyard Cinema. 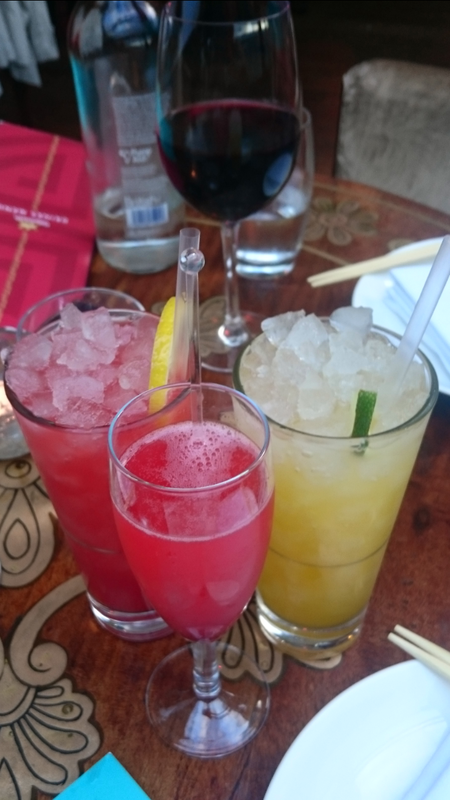 The cocktail list was extensive and my choice of Pazuzu cocktail served in a large cocktail glass had a sweet infusion of flavours, containing: Masumi sake, fresh raspberries, lime juice, mango syrup, cranberry juice and sprinkled with a dusting of cinnamon – delicious! As the booths were all reserved we took our drinks into the bright and airy Ginger Martini cocktail bar. Around ten minutes or so later a waitress came to advise us our table was ready and escorted us into the restaurant and to our booth seating area that gave us a voyeuristic outlook of the entire restaurant. 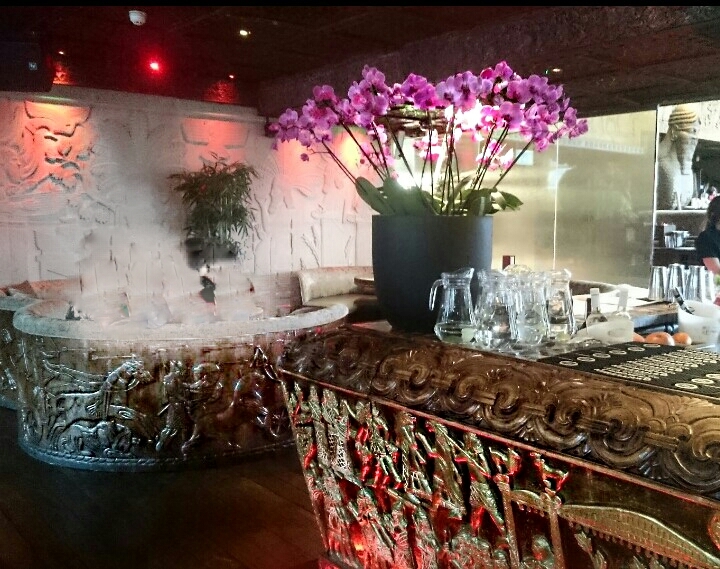 We were enthralled by the opulent decor of the restaurant, taking in the gilded, gold bar area, bamboo trees and high ceiling with open retractable roof giving an al fresco feel to our dining experience. We were given the set menus as part of our Virgin Experience Days voucher deal, which included a three course meal and a choice of four cocktails – I ordered the Strawberry Twist, served in a large glass with plenty of ice and although this did not appear to have as much alcohol as the Pazuzu, it was refreshing. 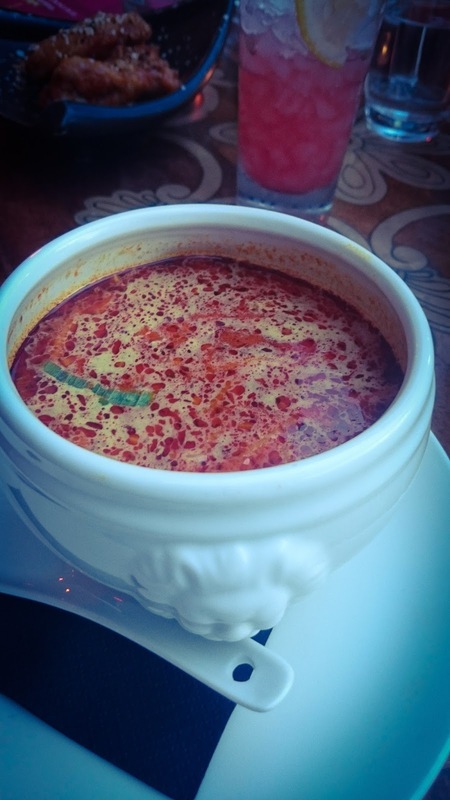 For starters, I ordered the Spicy Laksa Soup which included Malaysian style tiger prawns, rice noodles with bean sprouts, coriander and chilli. Boy was it spicy! 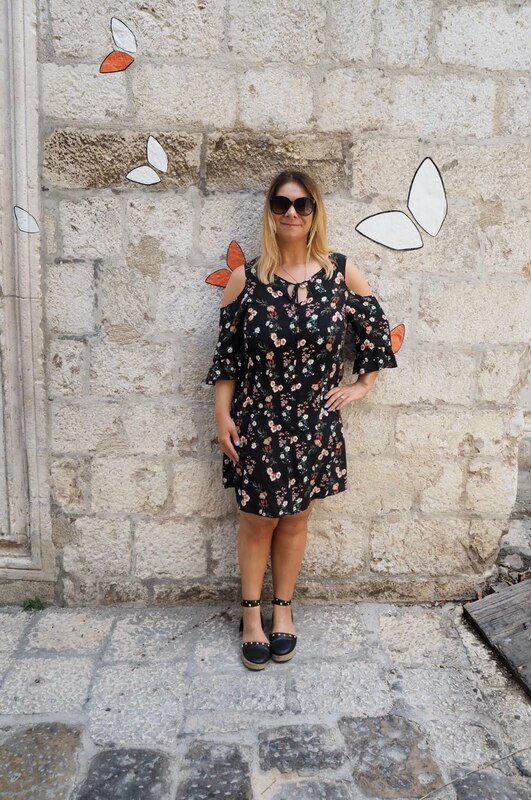 The chilli in the soup had a real kick to it, tantalising to the taste buds with my friend Amy and I taking a break in between mouthfuls to cool our palate! 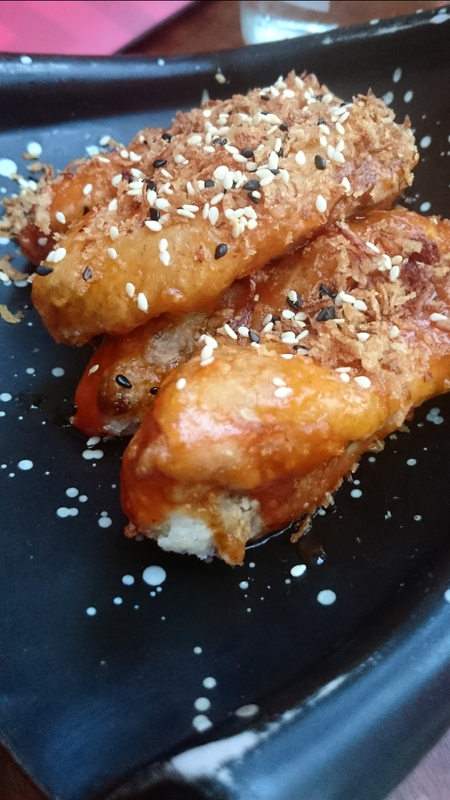 Our friend Lisa watched in amusement as we persevered with the soup, whilst tucking into her Crispy Chicken Wings with sweet and sour kimchi glaze topped with crispy garlic. The Chicken Wings had a succulent flavour, not too spicy with the sweet chilli sauce complimenting the garlic and perfectly cooked chicken. 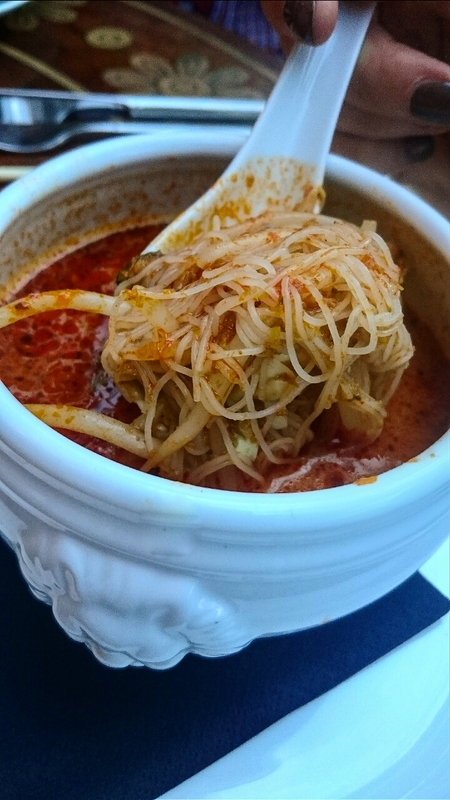 For a soup, the Laksa dish was very filling and by the time we managed to finish, the mains were brought out within minutes of our starters being cleared. 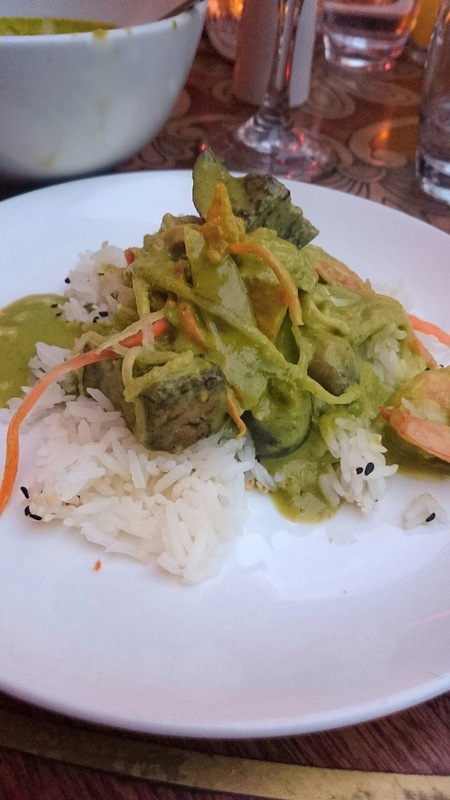 The Malaysian Jungle Curry I ordered for my main came with green chilli (more chilli! ), lemongrass, Thai basil, green peppercorns with sticky Jasmine rice and following the very hot Laksa Soup starter I wasn’t sure I could take any more heat…The curry was thick and thankfully had a milder taste, being more of a Thai green curry. The jungle curry contained a sufficient amount of seafood: prawns, calamari, scallops with lychees included to give a sweeter taste. Regretfully, I was still full from my starter to devour all of the curry, though the blander flavour of the curry, along with cocktails did aid in the cooling of my palate. 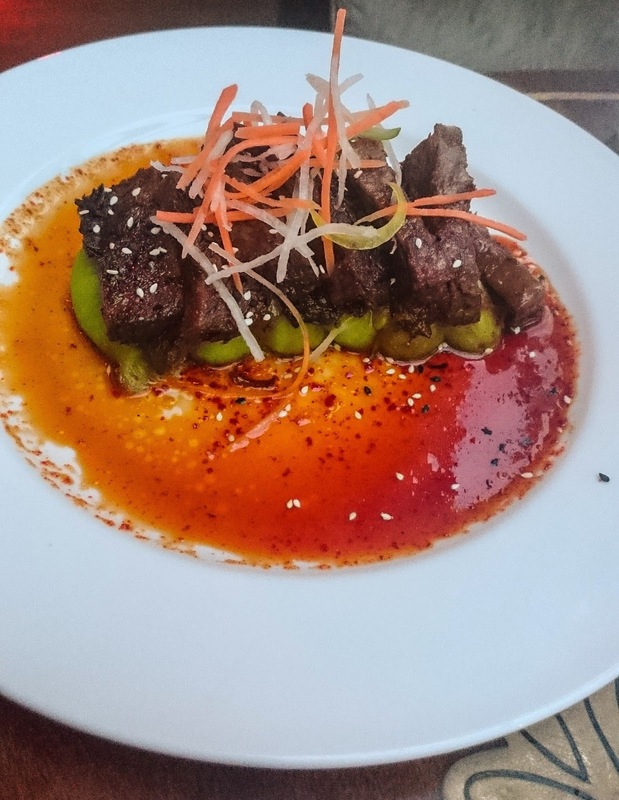 The other mains ordered were the Char-baked Fillet of Salmon, marinated in miso sauce accompanied with candied beetroot pickles and the Beef Bulgogi, slow roasted strips of beef with chive potato. 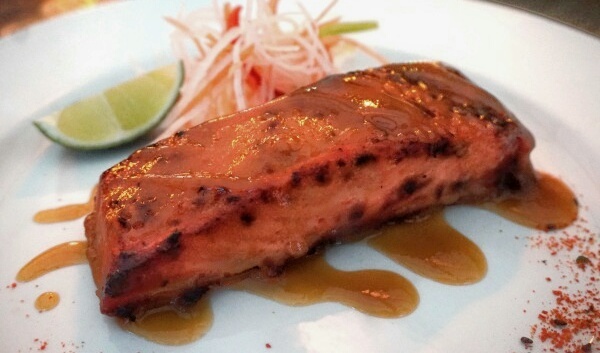 The salmon was a good size and cooked to my friend’s taste, though did not come with any side dishes, therefore she ordered the Ginger & Shitake Fried Noodles with chilli and onion to accompany the salmon. The beef was slightly overcooked, having more of a stew taste, which I liked, though my friend would have preferred more of a crispier taste – all down to personal preference. 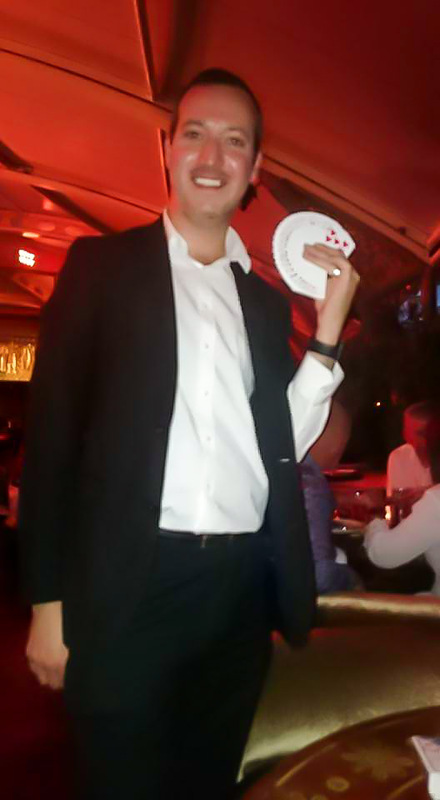 Our waiter was very attentive and friendly, making sure the magician entertaining the tables visited our table. 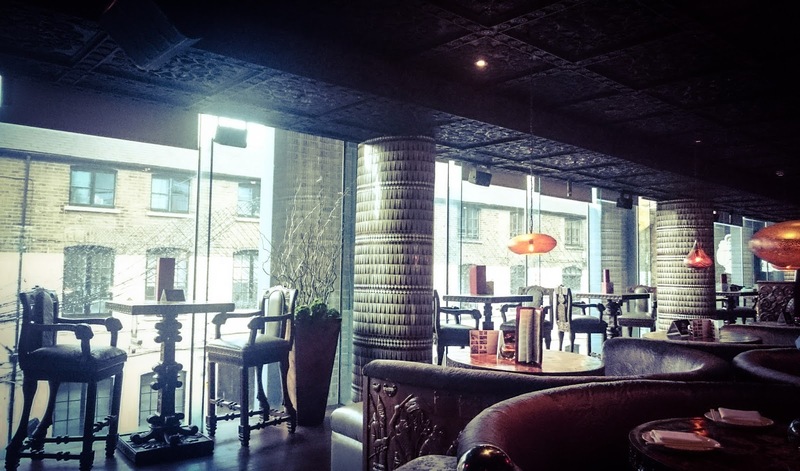 I am quite sceptical when it comes to magic tricks, though Stephen Barry had us mesmerised with his tricks, guessing our chosen cards and multiplying the number of rabbits in the birthday girl’s hand, giving us an entertaining twist to our dining experience. To finish, I ordered the rich-tasting Chocolate Brownie with pistachio and banana ice cream. In all honesty, I have tasted better brownies, though the sickly-sweet banana ice cream was incredible. Lisa ordered the Yuzu Meringue Tart with hibiscus and redcurrant fruit coulis, which she let me try and this had a sharp, tangy, acidic taste, being a contrast to my overly sweet dessert. 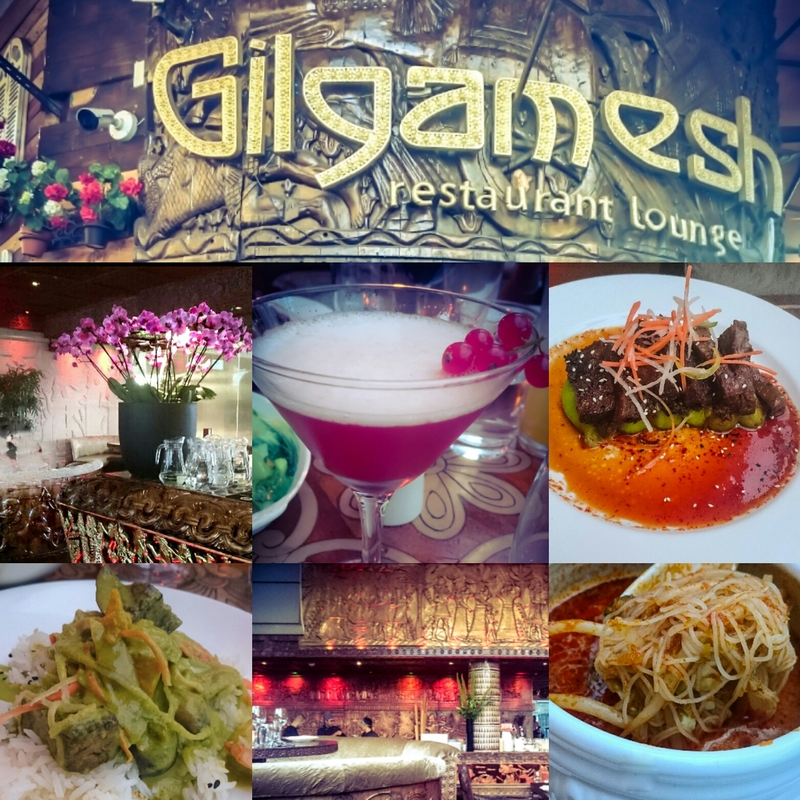 Gilgamesh is a truly visually stunning restaurant and bar, the perfect venue to celebrate a special occasion with good food and service. 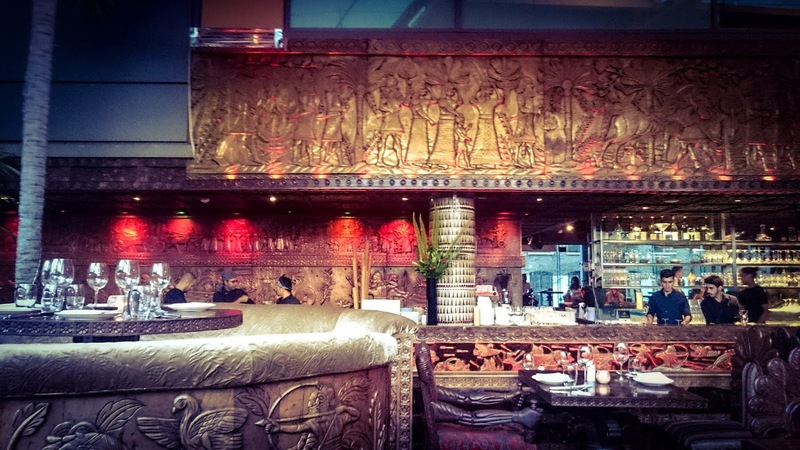 Being entertained by the Magician, Stephen Barry gave us a fun dining experience and I look forward to future meals and drinks at Gilgamesh.